I’m in love with this recipe. It takes a bit of planning, but it is so worth it – so much flavour! 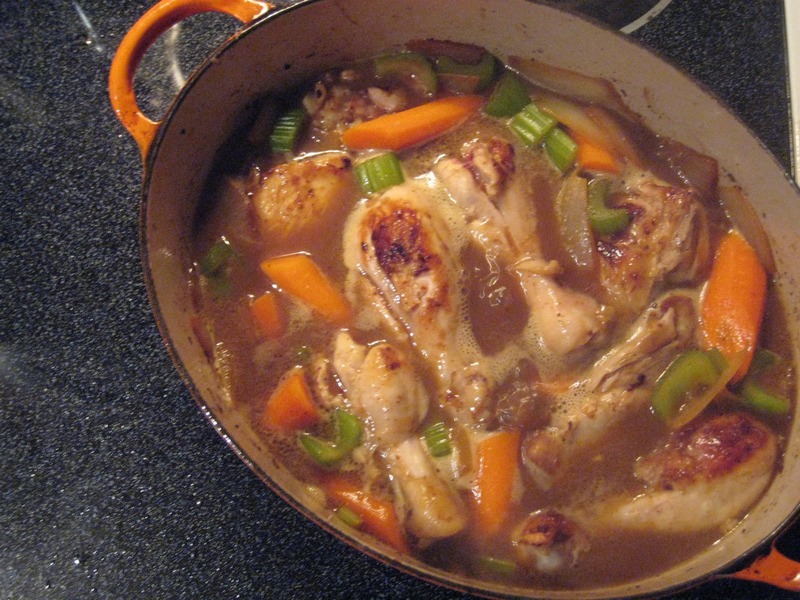 The chicken needs to be marinated, and it really does taste so much better when you use homemade chicken stock. You’ll want a nice crusty loaf of bread to go with this, to soak up the delicious juices. And a nice glass of wine can’t hurt. The recipe is from Country Living’s One-Dish Country Suppers book, and I’ve adapted it a bit. 1. To marinate the chicken, cook all the marinade ingredients (except the chicken!) for about 5 minutes. Let it cool to room temperature, then pour it into a container with the chicken and refrigerate for at least 4 hours, or overnight. 2. Remove the chicken from the marinade and pat it dry. Strain and save the liquid. 3. In a large pan, cook the bacon until crisp. Remove the bacon, then brown the chicken in the bacon fat. Remove the chicken and most of the fat. 4. Add the olive oil and onions, cooking until lightly browned. Add the carrots, celery, garlic and shallot, and cook for 5 more minutes. 5. Meanwhile, in a bowl stir a little of the marinade liquid into the flour, mixing so there are no lumps. Add the rest of the marinade liquid and mix, ensuring there are no lumps. 7. Add the potatoes, then cook for about 20 minutes, or until the potatoes are tender. 8. After a long-deserved wait you have a fabulous dinner to sit down to. Top each portion with a little of the bacon, and enjoy a nice glass of wine with it!